Zhou Zheng (pseudonym) recently decided to try his luck in Beijing's car license plate lottery, seeking a plate for his family's second vehicle. Zhou's decision came on the heels of reports that the capital city is making permanent odd-even plate limit, an arrangement implemented during the Asia-Pacific Economic Cooperation (APEC) Economic Leaders' Meeting in November whereby odd- and even-numbered license plates were allowed onto the road only on alternating days in a bid to improve air quality. "Every rumor can become true, just like we used to believe there wasn't much chance we would need to enter a lottery to buy a car," Zhou told the 21st Century Business Herald. "If this rumor turns out to be true also, then another license plate will make sure we're prepared." There are currently more than 2 million applicants in the lottery system, and the success rate for the last draw was 0.71 percent. Analysts have predicted that the rate will drop further as a result of the rumored odd-even plate restrictions. Beijing first imposed a traffic ban based on an odd-even license plate system during the 2008 Olympic Games, which saw 45 percent of the city's cars taken off the roads and helped clear the skies. Similarly, the city again saw two weeks of clear skies and eased traffic jams during the APEC summit, triggering public debate as to whether the odd-even plate limit should stay in place permanently. Result of a survey conducted by the Global Times in November showed that 56.9 percent of the 1,008 respondents supported odd-even plate limit, while another survey carried out by a poll center affiliated with the China Youth Daily found that 72.3 percent of 1,001 Beijing residents believed that the policy should become permanent. "We will consider these suggestions and study whether to make the rule permanent, including extending it to the weekend," Li Shixiang, a Beijing vice mayor, said at a forum in late November, news portal people.com.cn reported. "We will make unprecedented efforts to combat air pollution, so as to maintain 'APEC blue' [skies]." "APEC blue" was a phrase coined and mostly used sarcastically by netizens to describe the short-lived period of clear blue skies. 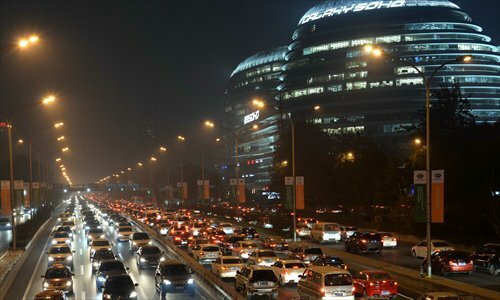 Beijing now has more than 5.2 million automobiles, according to the Beijing Municipal Bureau of Statistics. Meanwhile, Chen Tian, head of the Beijing Municipal Environment Protection Bureau, was quoted by the Beijing Youth Daily as saying in April that vehicle emissions contributed most of the density of PM2.5, particulate matter under 2.5 micrometers in size, in Beijing's air, accounting for 31.1 percent of local smog in the past year. But an anonymous source close to the municipal government told the 21st Century Business Herald that the odd-even limit is not likely to be imposed any time in the near future. "Both the Olympic Games and the APEC Summit were major events. [In those instances], the municipal government's implementation of the plate limit was understandable, because [they needed to] quickly solve the problem. However, it will not contribute to political stability nor would it be in line with the spirit of the Constitution if the policy becomes permanent," the source said. Cheng Xiaodong, chief automobile analyst at the National Development and Reform Commission, said that the odd-even plate limit is not a permanent solution to Beijing's traffic jams. "What the public cares the most is whether the government can get to the root of the problem, which includes better city planning and public transportation," Cheng was quoted by the newspaper as saying. Zhu Lijia, a public policy professor at the Chinese Academy of Governance, said that a permanent odd-even plate limit is legally feasible, since the government is responsible for coordinating and managing public resources, according to China Economic Weekly magazine. Law professor Zhang Xiang at Renmin University of China (RUC) pointed out, however, that it remains to be seen whether a permanent odd-even limit has any legal basis, as a permanent limit means that the use and effective value of personal vehicles are cut in half, which jeopardizes personal property rights. "Although the Constitution stipulates that the country can offer compensation under similar circumstances, there is so far no legal basis for a permanent traffic limit instead of a temporary one," Zhang explained. Another legal expert at RUC, Zhu Xiao, emphasized that a permanent odd-even limit must be based on a scientific conclusion regarding the policy to be implemented and its impact on the environment, and that the process of setting the rule must allow public opinion to be heard. Traffic expert Mao Baohua suggested that a better solution to Beijing's traffic problems would be to increase the cost of driving personal vehicles. Meanwhile, Shan Jingjing, an associate research fellow at the Chinese Academy of Social Sciences, believes that the city's huge population is at the root of the problem, and that the pressure on the city could be relieved by improving Beijing's layout. While people like Zhou jump back into the lottery pool, seeking a second license plate, many others have their eyes on a much faster way to fix the problem. Nearly half of the car owners in Beijing rented a car every other day during the APEC summit, reported the 21st Central Business Herald. According to statistics from Beijing-based car rental online forum baojia.com, the website browsing, new user registration and new orders number have seen rapid growth since the last week of October, with a 300 percent daily growth rate. Other car rental companies including CAR Inc and eHai Car Services also offered discounts before and during the APEC summit to win market share. Data have shown that every automobile in the city is on the road for an average of less than two hours per day, driving more than 50 kilometers, leaving over 90 percent of the city's automobile resources idle at any given time. "The future of the car rental business is bright, in light of the possibility of odd-even plate limit going permanent and rising public transportation fares," said Li Rubin, chief executive officer of baojia.com.